How to get there: This hike can be started from Gjendesheim (on the road Valdresflya) or from the DNT huts Gjendebu (access by boat on the Gjende lake from Gjendesheim) or Torfinnsbu (on the Bygdin lake). 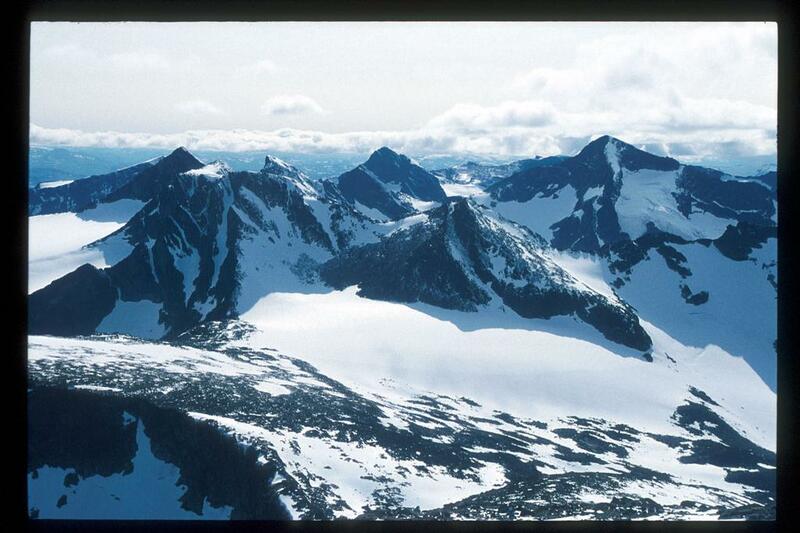 Route description: We hiked from the road Valdresflya, just south of Gjendesheim. 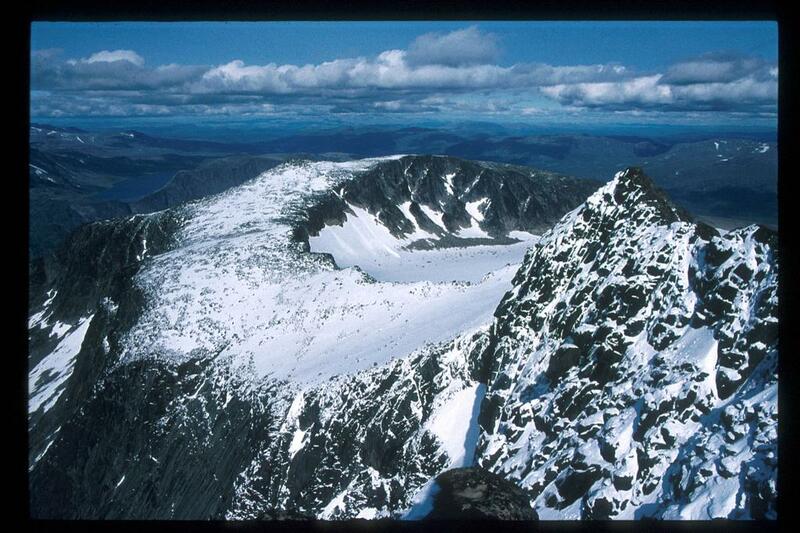 This route is a "classic" for hikes in the mountains south of lake Gjende. In more detail, we started from Leirungsdalen and hiked up the ridge to Bukkehammaren (1910 m, nice summit, with a primary factor of about 80 m.) We continued the nice ridge passed point 1899 and up Kvassryggen (point 2071 m). The next challenge was Høgdebrotet (2226 m). 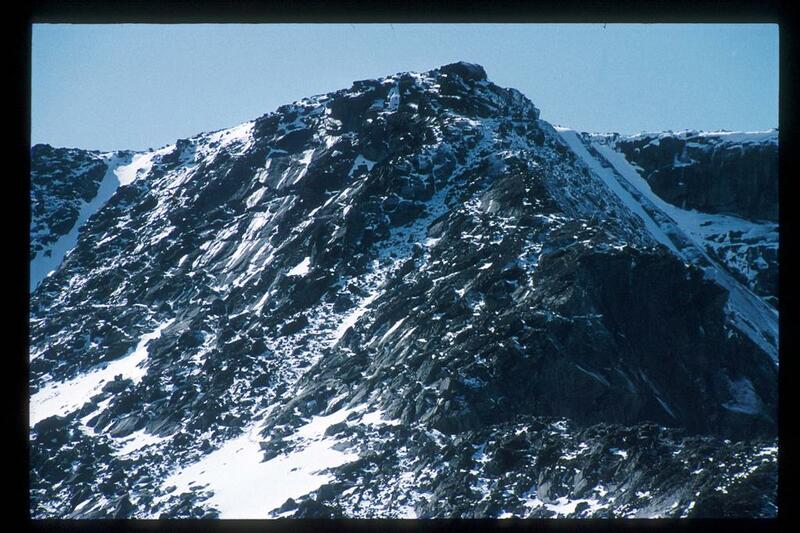 This is another nice summit, but again only 80 m primary factor. There was quite a bit of snow and we ended up climbing a route with considerable exposure (to the west) about as far right (on the ridge) as one can go. 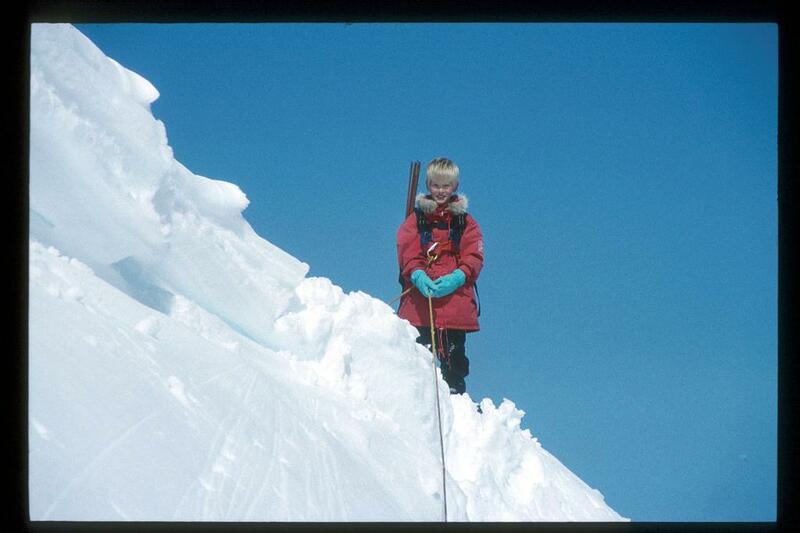 A rope was needed for safety (for the 9 year old) for the very last, short pitch before the flat summit. From Høgdebrotet, we climbed up a moderate snow slope and crossed over to the south side of Tjørnholstinden, quite high. A short traverse here brought us to the main summit. We continued west, then south across Tjørnholsaksla, a ranked summit (2145 m), then down to the lake Leirungstjønn (1545 m) where we established camp. Comments: This hike is quite long, it took us close to 13 hours allowing for several rests in the good weather. 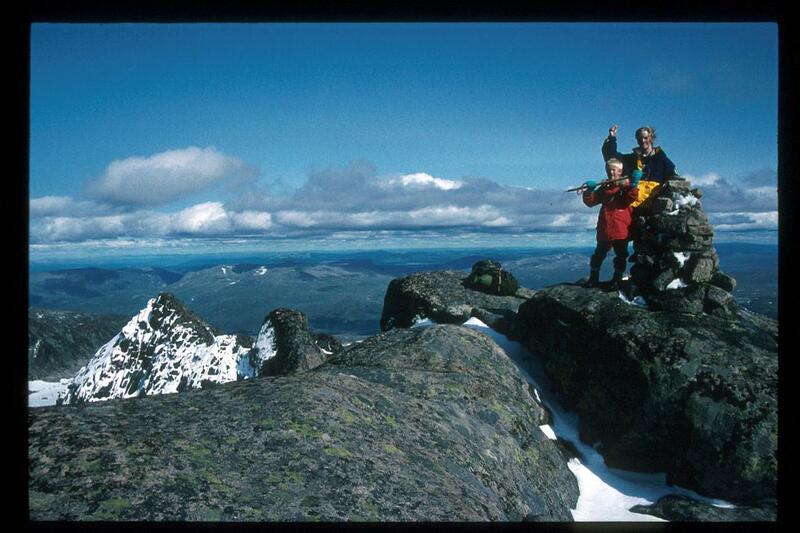 I did this hike together with my sons Pål Jørgen, age 9, and Tor Erling, age 16. Høgdebrotet, our route started in the middle lower part of the picture where a distinct gully starts out from a patch of snow. The gully runs up and towards the right and ends below the summit block. We first tried what looks like a possibility up left, but ended up climbing in the direct continuation of the gully along the narrow rock ramp that can be seen leading all the way to the sky on the right side of the summit. There is considerable exposure on the last move. This summit is unranked with a primary factor of 80 m.
A happy child, 9 years old doing his job while crossing from Høgdebrotet to the south face of Tjørnholstinden. The summit of Tjørnholstinden. Pål Jørgen, 9 and and Tor Erling 16 years old. View west from Tjørnholstinden. From left to right, Østre and Vestre Leirungstinden, then Knutsholstinden. Høgdebrotet, the way we came. There is a gentle route down to Steinflyi, however we came over Bukkehammeren and Kvassryggen, a more scenic, but also more challenging route.